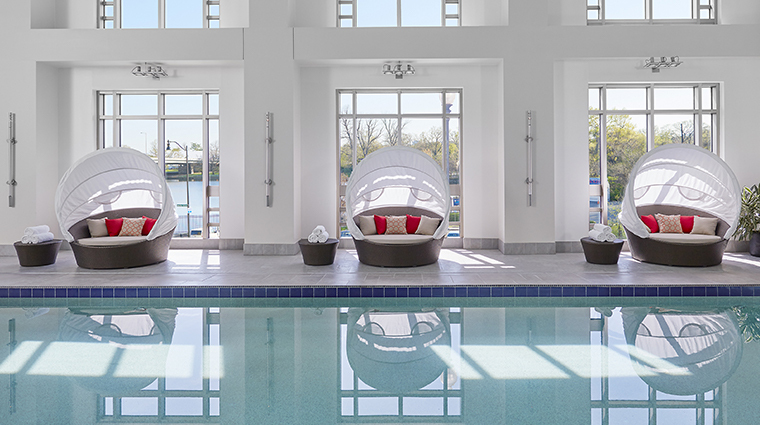 A view of the water is rather unusual for a hotel in Washington, D.C., but Mandarin Oriental boasts an impressive one of the Tidal Basin, the southwest waterfront and the Jefferson Memorial. 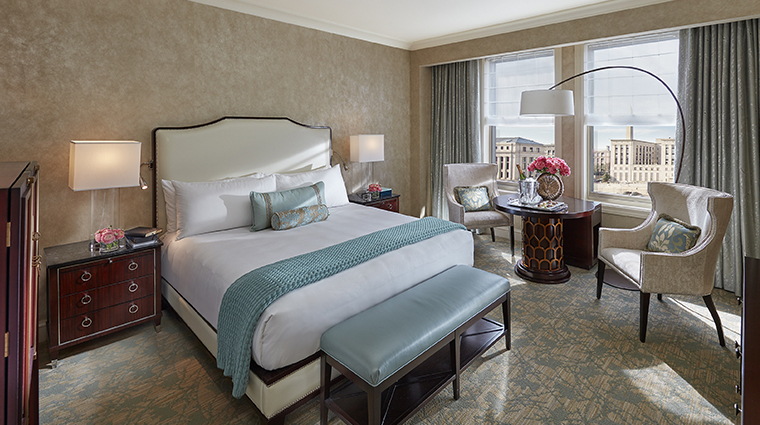 Towering nine stories above the water, the hotel’s neoclassical architecture reflects the original plans intended for Washington dating back to the 1700s, and with a limestone façade and ornate columns, it stands out against nearby government buildings. But the Mandarin Oriental’s interior is a whole different story. 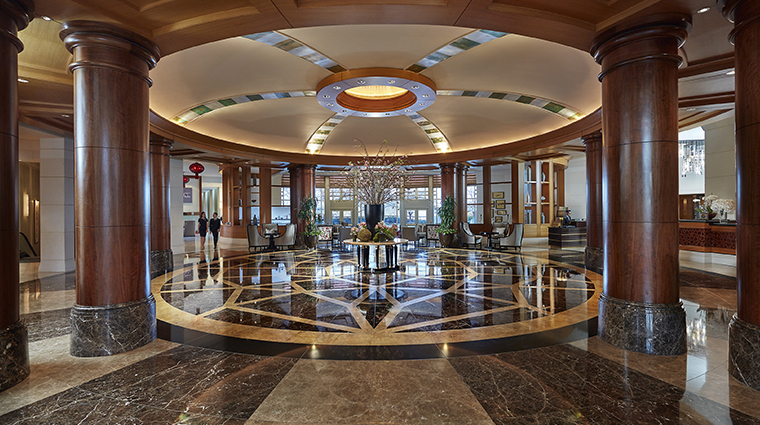 It follows the principles of feng shui in an East-meets-West design — the spacious lobby features massive American walnut columns, marble floors and Asian art. 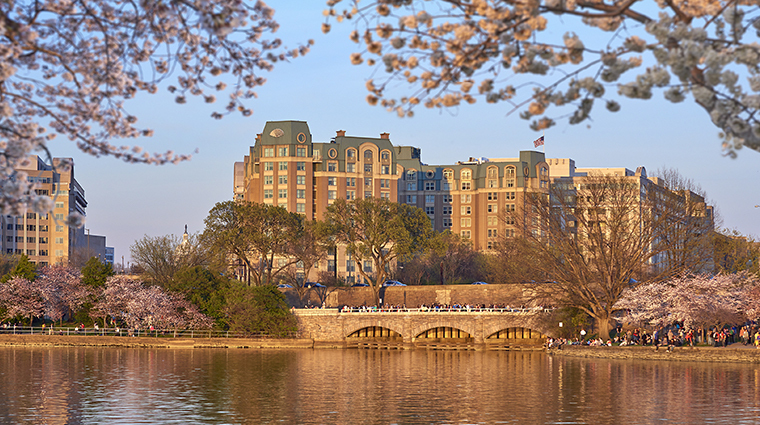 The sizable rooms and suites have flat-screen televisions encased in Japanese chests, custom-built furniture, deep soaking tubs and many have unbeatable views of the cherry blossoms, if you happen to be traveling at the right time to catch sight of these precious buds. The Smithsonian, Capitol Hill and many National Monuments are just a short stroll away, making this a good base for those looking to explore the city. 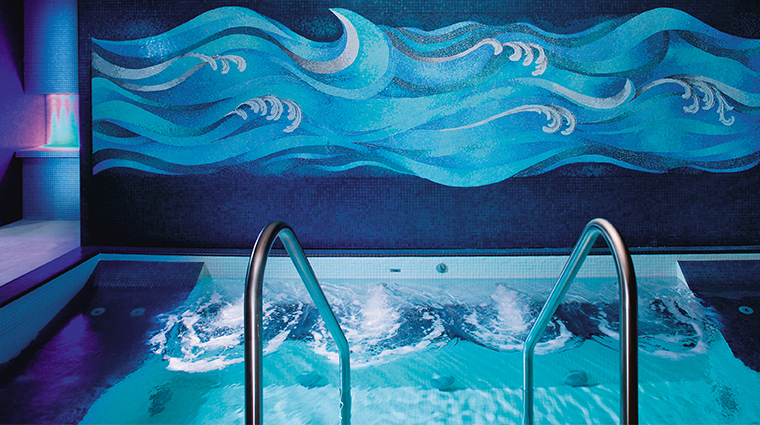 The D.C hotel’s Four-Star spa is arguably the city’s finest, and at 10,000 square feet, it’s also one of the largest. 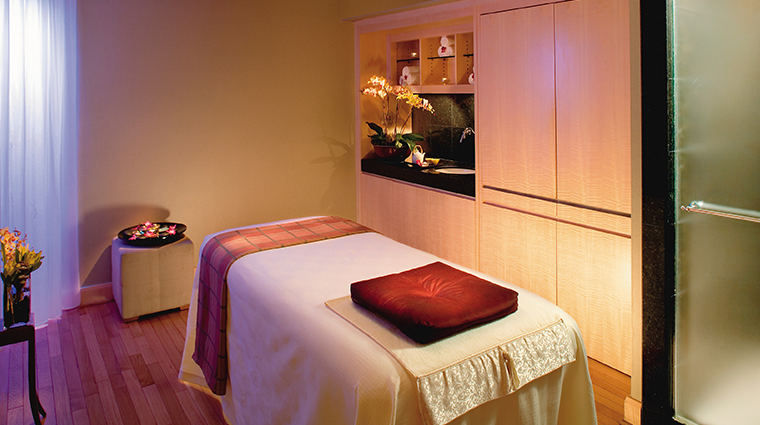 Book the Asian-inspired Bamboo Massage, similar to a hot stone but with the use of heated bamboo rods. 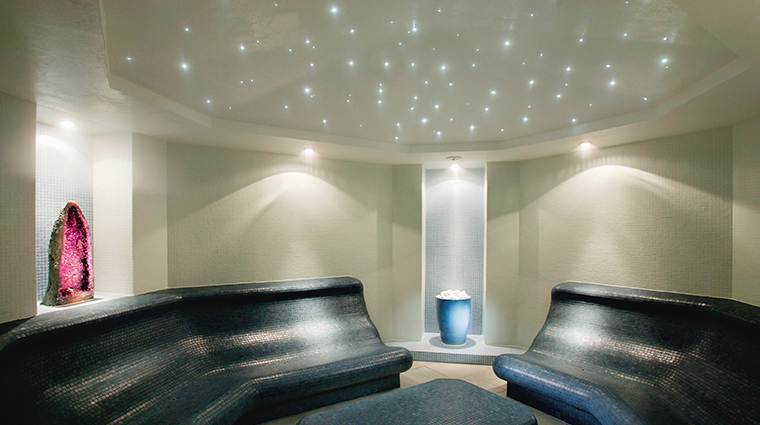 Even if you can’t fit in a treatment, hotel guests get to use the spa’s great facilities for free. For a respite from the crowds that gather in the capitol on the weekends, indulge in afternoon tea at Empress Lounge, served with finger sandwiches, scones and a selection of sweets from Friday through Sunday. Even city view rooms boast vistas of the Washington Monument, an easy and charming reminder that you’re staying in the nation’s capital. Despite the luxury hotel’s large size, it lives up to expectations with discreet, personalized service and friendly staff. 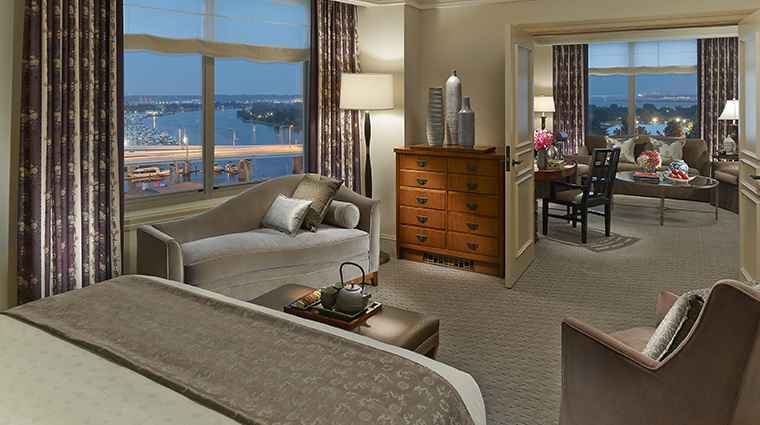 The Mandarin Oriental is the only luxury hotel on the southwest waterfront. 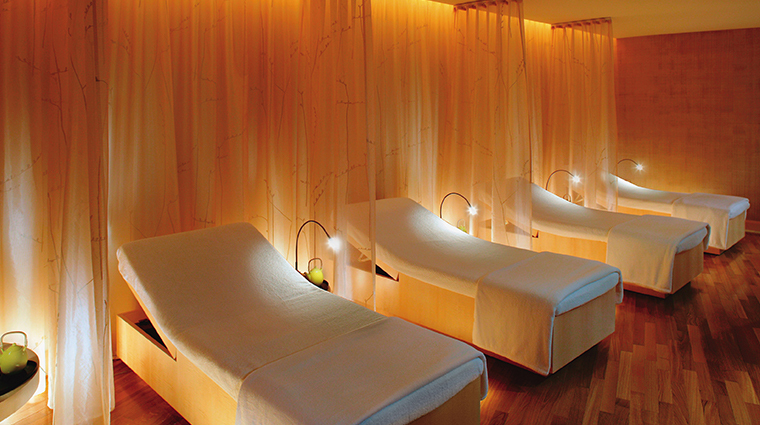 For locals, this means the hotel is an intimate getaway set apart from the hustle and bustle of the city. For tourists, it’s an easy walk to the Smithsonian museums and monuments. 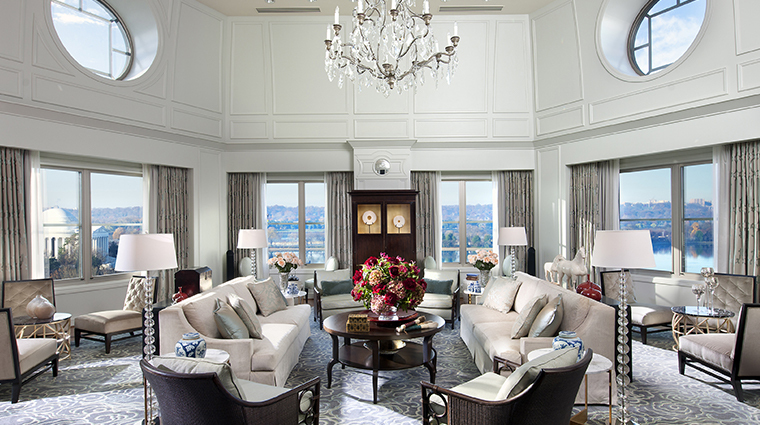 Guests in the Tai Pan rooms at the Washington, D.C. hotel enjoy their own dedicated concierge staff, but everyone can visit the main concierge desk for helpful and efficient service. The luxury Four-Star hotel plays host to the D.C. area’s largest events space, a 4,000 square foot lawn that overlooks the water. The bathrooms in the Mandarin Oriental’s guest rooms are on the small side and don’t have any high-tech amenities, but they offer good light and thoughtful touches such as lighted makeup mirrors and several hooks for robes and towels. 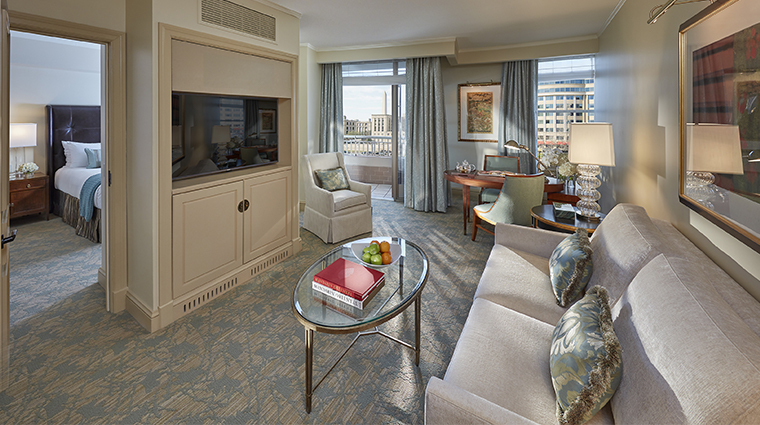 Rooms facing Mandarin Oriental, Washington DC’s quiet and serene courtyard are popular, but it’s the Water View rooms, overlooking the waterfront or Tidal Basin (and Jefferson Memorial), that afford the best views. The guest rooms feature contemporary décor accented by shades of jade green and dashes of robin’s egg blue, enhanced by earth tones and the rich dark wood furnishings. 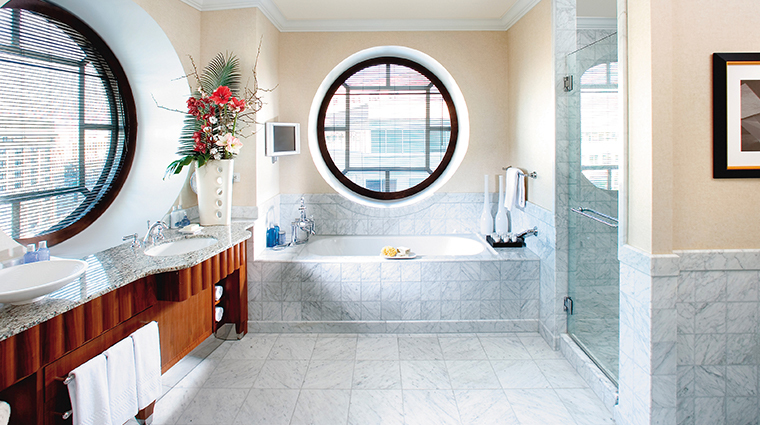 Bathrooms at Mandarin Oriental, Washington DC come decked out in marble and tile featuring a single sink, full soaking tubs and a separate standing shower. Even the standard rooms feature cool in-room technology like touch pad lighting controls, smart thermostats, 55-inch LED televisions and interactive entertainment systems with smart device integration. 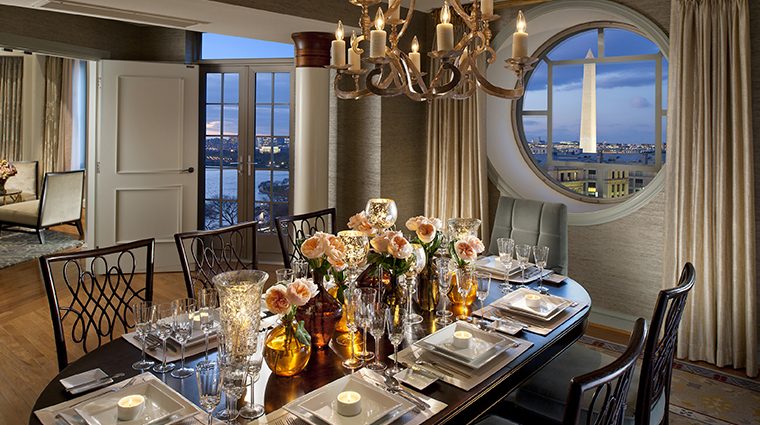 The Mandarin Oriental, Washington D.C.’s signature restaurant, Muze, offers waterfront views in a stylish dining room serving up modern American cuisine with an Asian twist. Menu highlights include a Thai beef salad with green papaya; a capital hill sushi roll with king crab, avocado and cucumber; and Maine lobster xo served with cilantro, shitake mushrooms, rice noodles and crispy lotus root. Muze is open for breakfast, lunch and dinner, incorporating the East-meets-West theme throughout the day. Breakfast might include shakshuka (a soft-boiled egg cooked in stewed tomatoes with harissa spice and naan) or assorted dim sum. A seasonal outdoor terrace is available for dining in warmer weather with views of the hotel’s gardens and open fire pits to complete the ambiance. 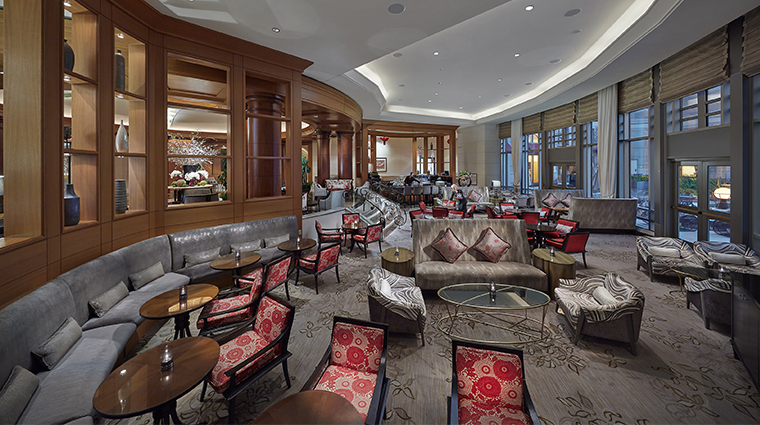 Craft cocktails, small bites and sushi are available all day at Empress Lounge. A popular afternoon tea service is also available on the weekends and reservations are strongly recommended.